11th June 2017 – On any normal weekend it would be nearly impossible to know where to start the round-up due to the quality and quantity of performances by PACE athletes. However, this was not an ordinary weekend. 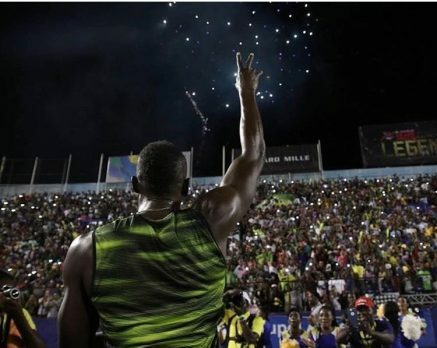 Saturday night saw Usain Bolt (JAM) run his final race in front of his adoring home fans and what a send-off they gave him. On a very emotional night where Usain admitted to being as nervous as he has ever been for a 100m race, he still delivered the performance that everyone came to see winning his 100m race in 10.03 seconds. There was also victories for Mo Farah (GBR) over 3000m, Jenna Prandini (USA) 200m, and Shamier Little (USA) 400m hurdles. Jenna doubled up to take second in the 100m and Jaheel Hyde (JAM) and Ristananna Tracey (JAM) were also in the top three in their respective 400m hurdles races with Jaheel taking second and Ristananna third. Kemar Bailey-Cole (JAM) was fourth in his 100m race. In the US there was a huge breakthrough for Schillonie Calvert-Powell as she smashed her PB over 100m and broke the 11 second barrier for the first time, winning the ALTIS Summer Series meet and running 10.94 seconds in her heat. This performance takes her top of the PACE all-time rankings. There were further successes for Galen Rupp (USA) over 10,000m and Shannon Rowbury (USA) 5000m at the Portland Track Festival and Laura Roesler (USA) over 800m in Texas. Also in the middle distances Winny Chebet (KEN) kept her fine form from Rome in the week going with a third place finish over 1500m at the IAAF World Challenge meeting in Hengelo. This meeting also saw Bethwel Birgen (KEN) and Vincent finish fifth and sixth in the men’s event. Michael Rimmer ran a seasons best of 1:46.72 in the 800m.